Abstract: For more than forty years Primary Health Care (PHC) has been recognized as the cornerstone of an effective and responsive health system. The Alma-Ata Declaration of 1978 reaffirmed the right to the highest attainable level of health, with equity, solidarity and the right to health as its core values. It stressed the need for comprehensive health services, not only curative but services that addressed needs in terms of health promotion, prevention, rehabilitation and treatment of common conditions. A strong resolutive first level of care is the basis for health system development [...] The Pan American Health Organization/World Health Organization (PAHO/WHO) has supported the countries in the establishment of interprofessional PHC teams, in the transformation of health education and in building capacity in the strategic planning, and management of human resources for health. 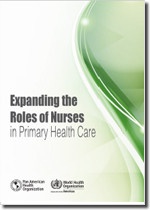 Nursing can play a critical role in advancing PHC. New profiles such as the advanced practice nurses, as discussed in this document, can be fundamental in this effort, and in particular, in health promotion, disease prevention and care, especially in rural and underserved areas.